Version 1: I jumped out of the window and sped my car to the maximum limits! I did not want to go back as I was not ready for it. I could hear the music and revelry outside, but I was not willing to tie a knot. Its not that he is not a nice man, but my understanding of a life-partner does not see him as a prospect. I argued with my parents, but they did not listen. They often introspect, if I am going around with someone. I am single and free! Version 2: Getting the make-up done was tough as I had streams of tears rolling down my cheeks. I had always dreamt of marrying but not the one who was groomed for me today. I wanted to elope with my boy friend but he was a bit apprehensive about it. I felt as if I am forced into it. The make-up was done and I was taking the steps down to the road where noticed him waving at me, I ran to him and we sped away. I am happy today! Version 3: He said, you can go if you love some one else. I looked up, smiled and ran out on the boundless road. I felt relieved. I had to stand up for my love and I could find it inevitable today. I head to the railway station where my love is waiting for me! Author's Note: The idea stuck me after watching Vipul Shah's, Namaste London. 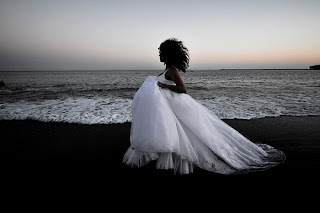 The idea of bride running away during the wedding really facinates me!